Fifty years ago on Friday, Lee Harvey Oswald killed President John F. Kennedy with a mail-order rifle he purchased from an ad that appeared in the National Rifle Association's American Rifleman magazine. The ad, from Klein's Sporting Goods in Chicago, was one of many that peppered the magazine back then inviting readers to buy guns. 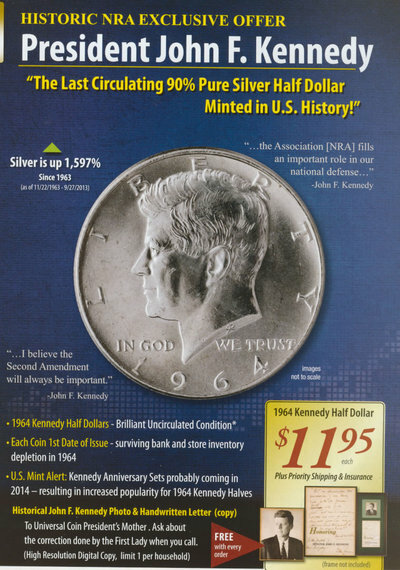 The magazine also features a full-page ad and accompanying multi-page "advertorial" presenting a "Historic NRA Exclusive Offer" from NRA corporate donor Universal Coin & Bullion to purchase a John F. Kennedy half dollar -- "The Last Circulating 90 percent Pure Silver Half Dollar Minted in U.S. History!" -- for only $11.95 (plus "Priority Shipping & Insurance"). Universal Coin & Bullion is one of the NRA's top "corporate partners" and a member of the "NRA Business Alliance." It has given between $500,000 and $999,999 to the organization. (In addition to non-firearm financial patrons like Universal Coin & Bullion, financial support for the NRA from gun industry "corporate partners" alone may be as high as $60 million since 2005). In "commemorating fifty years," the ad promises the potential buyer that "Silver is up 1,597 Percent Since 1963 (as of 11/22/1963 - 9/27/2013). " Yes, the increased value of the coin is actually pegged to the date of Kennedy's assassination! But, in the tradition of hucksters everywhere: Wait, don't answer yet! The ad promises that if you buy 10 or more coins you can get a free copy of "The Grassy Knoll DVD." 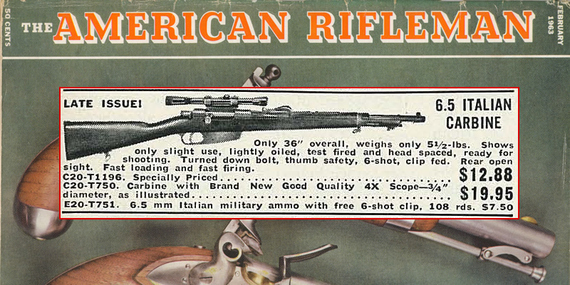 So, to summarize this bizarre daisy chain: Lee Harvey Oswald buys his rifle through the NRA's American Rifleman magazine. Fifty years later, the magazine marks the anniversary by offering a "Historic NRA Exclusive Offer" hawking silver JFK half dollars issued after his assassination. And the company selling the coins is an NRA "corporate partner" that has donated up to a million dollars to the NRA, aiding the organization in its efforts to stop gun violence prevention laws. It's regretful, but unfortunately not surprising, that the Kennedy assassination is being used as a launching pad for corporate hucksterism. However, it is truly shameful that the NRA not only showcases, but also benefits financially from, one of its "corporate partners" willing to exploit JFK's assassination.